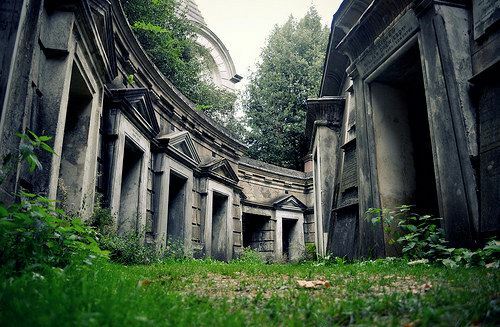 Highgate Cemetery is undoubtedly London's most famous burial ground, featuring a unique Victorian architecture as well as many listed graves and memorials. As such, we thought it made for an excellent choice for a VCL walk. During a 2h guided walk, we'll visit some tombs of the most famous and notorious residents on Highgate's East Cemetery, including Karl Marx' monument. When : Saturday 21 May at 2.30pm. The walk will start at 2.45pm sharp. Please bear in mind that we can't guarantee you'll be able to join the group if you arrive late. We'll meet at the gate at the West Cemetery (see below for exact address and travel info). Children under 14 go free, but please note that parents are responsible for their children at all times and that this is a place of Special Historic Interest and nature reserve. Also bear in mind that this is a 2h walk. Prior to the VCL walk of the Eastern Cemetery, those who wish to can also join a public tour of the Western grounds. With its sinuous paths winding up a steep wooded hill and its ivy-clad monuments, Highgate's Western cemetery is a secluded Victorian funerary landscape at its most evocative. This public tour requires a separate ticket (£12), which a VCL committee member will purchase on the day (i.e. no need to queue for yourselves). The tour will start at 1pm and will take about 90 minutes, so it will end in time to join the VCL walk of the East Cemetery. When : Saturday 21 May at 12.45 pm. If you are late you won't be able to join this group. We meet at the gate at the West Cemetery (see below for exact address and travel info). Children under eight are no allowed to join the tour of the West Cemetery tour (not our decision). For exact information on how to get to Highgate Cemetery, please consult the cemetery's website.